Our December newsletter looks at the issue of ethical investment. 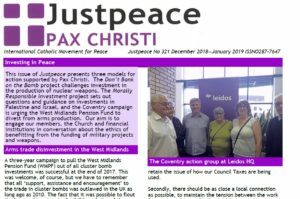 We explore three models of action supported by Pax Christi. Our aim is to engage our members, the Church and financial institutions in conversation about the ethics of beneffiting from the funding of military projects and weapons.